If you light a lamp for someone, it will also brighten your own path (proverb). Two years ago I decided to leave the corporate law world of mergers and acquisitions and set up a gardening business with my wife. For some people setting up any business might be nerve wracking. It can be, but this had more or less been my previous job when I was a lawyer, so setting up a business didn’t worry me too much. What did worry me was running a business without being part of something bigger. When I was Lawyer I was a member of the Law Society of Scotland and the Law Society of England & Wales. In a previous carer as a Social Worker I was part of a large Local Authority social services department, and before that career I had served in the military and I was part of Her Majesty’s Armed Forces. I was now a gardener, and I felt a bit lonely. It felt a bit strange not belonging to something. I didn’t like it. For me, it didn’t feel professional. I carried out some research and was delighted to come across The Institute of Horticulture. Not only that, there was an indication that the Institute was hoping to obtain Chartered status in the near future. It was exactly what I was looking for, and I joined. I was now a member of the Institute of Horticulture. I was part of a well respected, highly regarded, professional organisation. I started to receive those comforting membership emails we receive as members. One of those emails read, ‘Applications are invited for a Mentoring Programme’. I was really excited about this. I had been a mentor and had been mentored in all of my previous careers. I knew how beneficial it was to (1) career development, (2) professional development, and (3) personal development. In fact mentoring was probably regarded as a condition to progression in my previous careers. The theory behind this was, how can someone progress and develop unless they actively engage in the progression and development of others? It’s a mentor / mentee continual learning and support loop. I learn, you learn, the organisation learns. I benefit, you benefit, the organisation benefits. I completed the application to become a mentee on the Mentoring Programme, and to my absolute delight I was accepted. I was later informed my mentor was a plant buyer for a garden centre attached to a hospital for ex-service men and women. I was thrilled. Gardening had played a part in helping me in my transition from military to civilian life, and here I was with a gardening mentor attached to a ex-service charity. My mentor and I made contact via telephone and then we met face-to-face at the garden centre where he worked. The first thing we did was set goals together. One of my goals was to improve my plant knowledge. I felt this was an area I desperately needed to develop. I also wanted to improve my confidence with plants so I could provide a planting service to my customers. Another goal was to overcome my dislike of roses. I remember my mentor saying, ‘right lets go’ and we set off from his office and out into the plant area of the garden centre. I must admit to thinking, ‘Oh no! He’s going to test me’. Of course he wasn’t. What he did was talk about all the different plants. Not in an, ‘I’ll say this plant’s botanical name and you’ll learn it’ kind of way (*phew). It was in a real life story telling way. Every plant he talked to me about had a story. I liked that. It connected with me. Now if connecting more with plants was all I got from the mentoring programme that would have been great. I could have walked round the garden centre every day listening to the story of plants. I would have enjoyed that. But, that’s not a business. I wanted to run a gardening business. My mentor knew this. He had run his own gardening business. His next goal – which I will be eternally grateful for – was to introduce me to his contacts at a commercial nursery, ….. and to help me get over my dislike of roses. My mentor had been buying and selling plants for decades. He had pretty much grown up knowing the family that owned the commercial nursery, and his own family had run (guess what?) 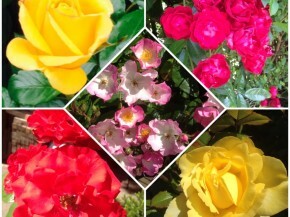 a rose nursery (! ), and now he was introducing me to these people as his mentee. I was taken aback. You don’t just walk into a mentoring relationship and get access to contacts like this, and to be honest you don’t just walk into this type of business relationship. Business relationships are like mentoring relationships; they are built on mutual transactions that are built up over time. You can’t just sit back and be mentored, that wont work – you need to engage in the two-way mentoring process. Soon after working with my mentor, a customer wanted some low maintenance and hardy plants. She was going abroad to live for 2 years. She wanted plants a tenant could look after, and ones that might still be there when she got back. I made a list of plants with prices, including the cost of my labour, together with a little story as to why I thought those plants would be good for her. She bought all the plants on my list. Another customer in her 80’s had connections with Japan. This elderly customer wanted a small tree for her garden. I made a list of 6 trees with a description, one of the trees on my list was a Japanese flowering cherry. The customer was delighted and wanted to buy it. I suggested the whole family get involved with the planting. The memory of three generations of her family in her back garden planting the tree with me on her birthday will stay with me for a very long time [I recall getting emotional at this part of my talk]. I also helped another customer purchase the first plants for her garden since her husband past away many years previously. It was an emotional step for her. She asked me to make some suggestions while I was working in her garden. She listened to my descriptions, my story of the plants. I remember her saying, ‘sounds great, I’ll take two’. I asked if she wanted to see a photo of it first. She said no, I like the sound of it, and I trust you. Now that felt good. There you go. I was connecting with customers through the story of plants, just like I had connected with my mentor. Not big stories. Just something that makes that plant connect with someone. I was also selling plants, and selling my knowledge and labour. For me, that’s a gardening business. My mentor helped me achieve that. And, what about my dislike of roses? I now have 5 varieties of my own, and they remind me of my time being mentored by someone who is now a Fellow of the Chartered Institute of Horticulture. If you get the opportunity to be mentored, or to be a mentor, I would highly recommend you take it. Perhaps it will take you on a journey like mine. I hope so. Thank you for listening, and to thank you also to my mentor and the mentoring programme.